You get a large version of the poster which can be projected on your interactive white board or printed out poster-sized. There is also a page with a smaller version, which is great to print out for students to glue into their math notebooks. 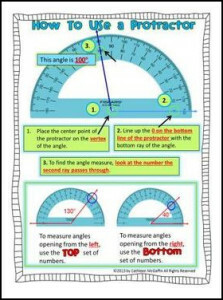 Please check out my other geometry products, which go into more detail about how to use a protractor not only to measure angles, but to sketch specific angles.